In the small town of Happy Valley-Goose Bay, Labrador rates of mental illness and suicide are high. The Friendship Bench Project can make a positive impact on the well-being of those living in this community. Several locations within the community including, The College of the North Atlantic, The Labrador Friendship Centre, Mealy Mountain Collegiate, Our Lady Queen of Peace School, and Peacock Primary School have expressed interest in having Friendship Benches and delivering the mental health programming. One business, Ds Landing (Darrelle Bennett) has expressed interest in purchasing a bench for the store. For these benches the cost will be almost $20,000. The benches come with a barcode on the back so that when people scan their phone a list of mental health resources near them will appear on the screen. 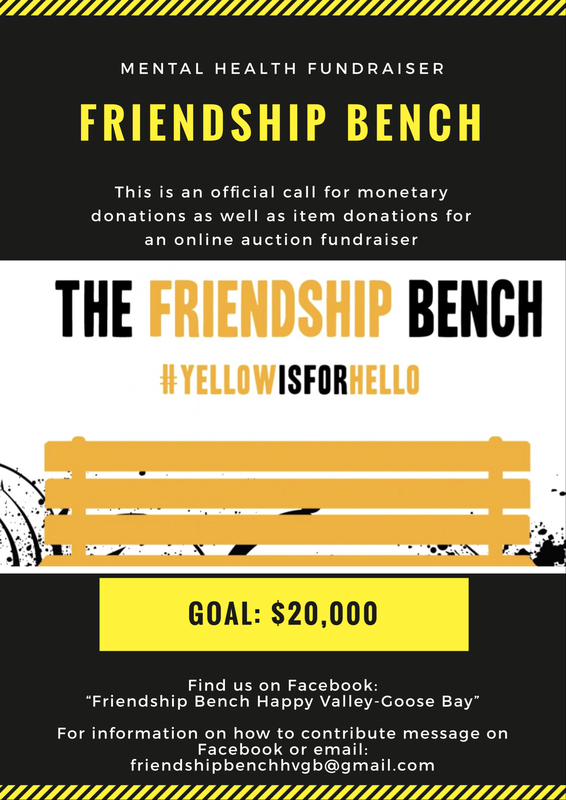 They also come with mental health programming called the #YellowIsForHello campaign that can be delivered at bench locations, #YellowIsForHello T-shirts and buttons to give away at the unveilings, and Sam Fiorella’s (the creator of Friendship Bench) attendance at the unveiling ceremony. We are now accepting both monetary and item donations for an online auction to make Happy Valley-Goose Bay a more supportive community for those living with mental illness.